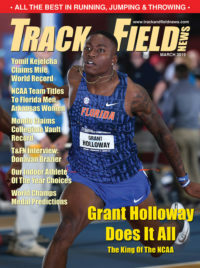 ARCADIA, CALIFORNIA, April 05–06—From the sprints to the distances, showdowns would be the name of the game for the boys portion of the Arcadia Invitational and there would be no better race to start than the 100m. Christian Grubb (Notre Dame, Sherman Oaks, California), an Arizona State recruit who plans to play football and run track for the Sun Devils, had been undefeated in both the 100 and 200 leading up to the meet. He ran 10.41 last month and was keen on winning here to keep his string alive. Given his PRs coming into this year—10.73 in ’17 and 21.39 in ’18—his rise was unexpected. Micah Williams (Benson, Portland), meanwhile, fresh off a successful indoor season that culminated with a New Balance Indoor 60 victory, was itching to get his outdoor season started against the Californian, who had a half dozen 100’s under his belt this season. Having run 10.37 in 2018 as a soph, Williams would need to be near that level to challenge Grubb. 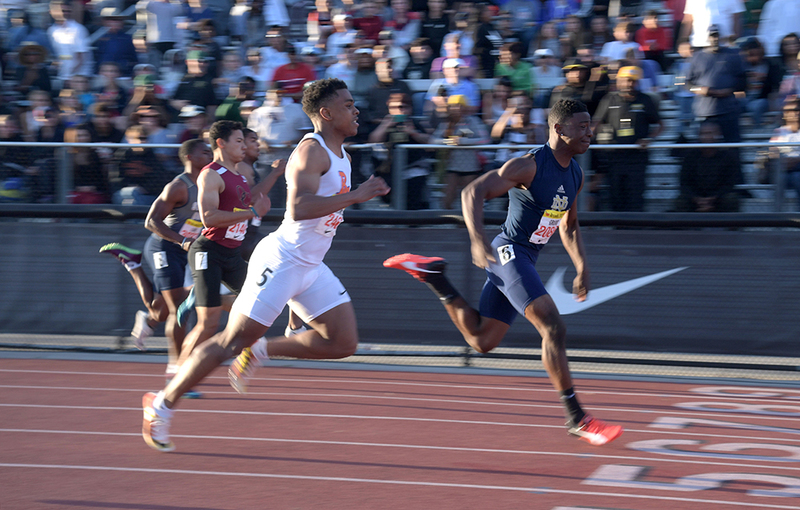 A clean start saw both runners get out even, but midway through the sprint, the 5-11/175 Grubb started to power away and crossed the line in 10.40, 0.09 ahead of Williams and 0.21 ahead of 3rd-placer Cristian Moore (Oaks, Westlake Village, California). Redemption was on Williams’ mind as he lined up against Grubb in the 200 some 2 hours later. With a PR of 21.17, Williams would need to counter the 20.93 Grubb ran two weeks ago. Not to be discounted, Justin Robinson (West, Hazelwood, Missouri), who ran 21.18 indoors, would be able to eye his competitors from lane 4 with Grubb in 5 and Williams in 6. As in the 100, Grubb got a good start and entering the straight was a good meter ahead of Williams. But with 50m left, Grubb began to tighten and Williams and Robinson pulled even 10m from the finish. Both Williams (21.03) and Robinson (21.06) set PRs, as they nipped Grubb (21.07) at the line. In its history, the 3200 at Arcadia boasts of having the most sub-9:00 performances of any meet in history. Although this would not set another sub-9:00 record, the duel between Nico Young (Newbury Park, California) and Cole Sprout (Valor Christian, Highland Ranch, Colorado) will go down in the annals of Arcadia lore. Sprout led a crowded field of 34 through a 64.8 first lap, with Young staying tucked in near the front. At 800, it was Sprout still leading, but Young had maneuvered to 3rd behind Matt Strangio (Jesuit, Carmichael, California). Halfway was crossed in 4:22, but it was down the backstretch that Sprout would increase his pace and try to break Young. Young would have none of it. As the two lengthened the distance between themselves and the rest of the field, they would never be separated by more than a step. With Young hovering behind, Sprout kept the pressure on by not letting the pace slide. A steady diet of 65s gave the two a comfortable cushion ahead of the rest and at the bell Sprout was just a 10th ahead of Young. The pace increased down the backstretch with both waiting to unravel their kicks. With 150 left, Young began to unwind his legs and let his 3:45.74 speed work its magic. As he entered the homestretch, Young edged past Sprout, but Sprout did not cave in. Young’s speed endurance would prevail, however, and he completed his final circuit with a 59.6, finishing in an outstanding 8:40.00 (worth 8:43.02 for 2M), moving to No. 10 on the all-time list, with Sprout just 0.79 behind in 8:40.79. Young’s mark was also a national age-16 record (as was his en route 8:11.02 at the 3000 point). Third went to Drew Bosley (Homestead, Mequon, Wisconsin) in 8:49.28, holding off Charles Hicks (Bolles, Jacksonville) in 8:49.62 with 10 more under 9:00. Said Young, “I’ve been working on my kick all year and it paid off tonight. My initial plan was to make a move on him after 800 meters, but he was surging numerous times. I had to just keep up. I changed my plans and made my move late.” Oh, and in case you wanted to have something to look forward to next year, both Young and Sprout are juniors. 100(1.4): 1. Christian Grubb (Notre Dame, Sherman Oaks, Ca) 10.40; 2. *Micah Williams (Benson, Portland) 10.49; 3. Cristian Moore (Oaks, Westlake Village, Ca) 10.61. 200(-1.0): 1. Williams 21.03; 2. *Justin Robinson (West, Hazelwood, Mo) 21.06; 3. Grubb 21.07. 2. Zach Larrier (Monterey Trail, Elk Grove) 46.49; 3. *Solomon Strader (West Ranch, Stevenson Ranch) 47.28. 800: 1. Kai Wingo (Valencia, Ca) 1:52.45; 2. *Chase Gordon (Jesuit, Carmichael, Ca) 1:53.06; 3. Armando Bryson (Wilson, Long Beach) 1:53.16. Mile: 1. Chase Rivera (Bolles, Jacksonville) 4:11.24; 2. Rylan Stubbs (Campo Verde, Gilbert, Az) 4:11.72; 3. *Christopher Middleton-Pearson (Dublin, Ca) 4:12.48. 2. *Cole Sprout (Valor, Highlands Ranch, Co) 8:40.73 <8:43.75> (8:10.75 HSL); 3. Drew Bosley (Homestead, Mequon, Wisconsin) 8:49.28 <8:52.35>; 4. Charles Hicks (Bolles) 8:49.62 <8:52.70>; 5. Cole Bullock (Red Bank, Chattanooga) 8:50.70 <8:53.78>; 6. *Leo Daschbach (Highland, Gilbert, Az) 8:51.09 <8:54.17>; 7. Liam Anderson (Redwood, Larkspur, Ca) 8:51.89 <8:54.98>; 8. *Evan Holland (Ashland, Or) 8:51.93 <8:55.02>; 9. Colin Baker (Academic, Mt Pleasant, SC) 8:54.68 <8:57.79>; 10. Camren Fischer (Fayetteville, Ar) 8:55.04 <8:58.18>; 11. Joe Waskom (Mt Si, Snoqualmie, Wa) 8:56.52 <8:59.64>; 12. Caleb Easton (Middleton, Wi) 8:57.67 <9:00.79>; 13. *Thomas Boyden (Skyline, Salt Lake City) 8:58.90 <9:02.03>; 14. *Matt Strangio (Jesuit) 9:00.58 <9:03.72>. 110H(0.3): 1. *Jamar Marshall (St Mary’s, Stockton) 13.87; 2. Warren Williams (West, Tracy, Ca) 14.01; 3. Andre Turay (Bullis, Potomac, Md) 14.05. 300H: 1. Matthew Harris (St Pius X, Atlanta) 37.23; 2. James Rivera (Lakewood Ranch, Bradenton, Fl) 37.45; 3. Marshall 37.70. 4 x 100: 1. Clovis North, Fresno 41.29; 2. Harvard-Westlake, Studio City 41.53; 3. Poly, Long Beach 41.63. 4 x 200: 1. Poly 1:25.91; 2. Rancho Cucamonga 1:27.75; 3. Central, Fresno 1:28.07. 4 x 400: 1. Poly 3:16.28; 2. Bullis 3:17.08; 3. Wilson 3:17.92. 4 x 800: 1. Loyola, Los Angeles 7:48.13; 2. Great Oak, Temecula 7:49.96; 3. St. Francis, Mountain View 7:53.35. 2. West Ranch 17:32.59; 3. Dana Hills, Dana Point 17:34.86; 4. Great Oak, Temecula 17:39.51. 800Med: 1. Harvard-Westlake 1:29.82; 2. Bullis 1:32.24; 3. Banneker, Brooklyn, 1:33.00. SpMed: 1. Wilson 3:28.57; 2. Ridgewood, NJ 3:32.23; 3. Leuzinger, Lawndale 3:34.12. 2. West Ranch 10:16.49; 3. St. Francis 10:16.67. 4 x 110H: 1. Vista Murrieta, Murrieta 62.60. HJ: 1. *Trey Tintinger (Helena, Mt) 6-11; 2. *Joseph Ruddell (Morro Bay) 6-9. PV: 1. Samuel Wright (Lodi, Ca) 16-1; 2. Zachary Klobutcher (Tahoma, Kent, Wa) 16-1; 3. Jacob Rice (Rancho Bernardo, San Diego) 16-1. LJ: 1. *Caleb Foster (Clovis North) 25-1½; 2. Micaylon Moore (Ft Collins, Co) 23-6. TJ: 1. *Namir Hemphill (Upland, Ca) 48-5½; 2. Allam Bushara (Ft Collins) 48-½; 3. *Tianhao Wei (South Pasadena) 47-11¾. SP: 1. Daniel Viveros (Liberty, Bakersfield) 66-9; 2. Tanner Duffin (Pius X) 65-11¼; 3. Jeff Duensing (Esperanza, Anaheim) 64-5½. DT: 1. Corey Moore (Liberty, Henderson, Nv) 200-11; 2. Duffin 194-2; 3. Christian Johnson (Buchanan, Clovis, Ca) 189-9; 4. Viveros 187-7. Open DT: 1. Cian Quiroga (Valor) 189-2. 3. Elby Omohundro (St Christopher’s, Richmond, Va) 6763; 4. *Gage Knight (University, Palm Harbor, Fl) 6533. Long a fixture on the SoCal track scene, Brian Russell won the Arcadia Invitational 2-lapper in ’76, was the national Junior 1500 runner-up the next year and went on to set a UCLA record in the event at 3:42.10. 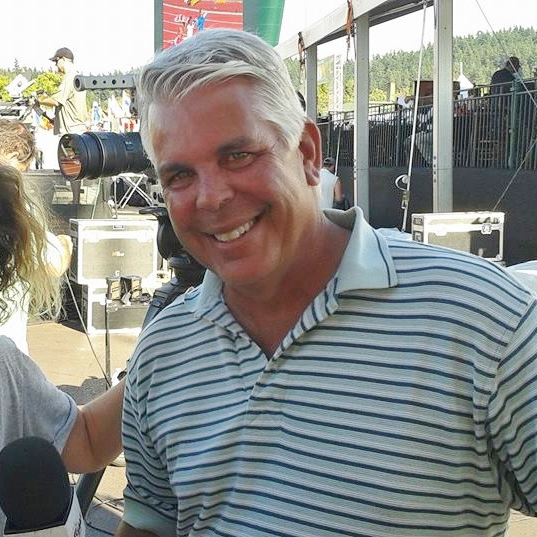 These days he’s frequently involved on the production side of major track telecasts.